Powers/Abilities: Other than being able to transform from Freddie to Captain Flower, we don't actually see the hero demonstrate any powers. 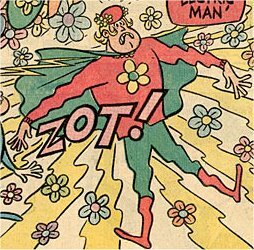 History: Freddie the Flower Boy is able to turn into the hippie superhero Captain Flower by sniffing on a flower. In his civilian identity, he hangs out at Sweet Mom's "The Flower Pot". The only enemy we see him face is the villainous 'Lectric Man, who can deliver shocking handshakes. Comments: Drawn by Fred Rhodes. Any Additions/Corrections? Please let me know. All images and characters depicted on this site are copyright their respective holders, and are used for informational purposes only. No infringement is intended and copyrights remain at source.